How do you make space and time for students to ask questions in class? No doubt you’ve been to a teacher training session that uses the parking lot. It works, kind of. Sticky notes fall off all the time, I’m always too shy to get up front and put my question on the board, and maybe I’d like to preserve the questions and their answers after the meeting. My aim is to explore additional options. h/t to @occam98 for first showing me this tool. What is it? Space to ask free-text questions or give feedback + a voting tool for existing questions. How’s it work? You provide a link to students and they ask and vote on questions. Cool feature: That voting feature is super-cool. It’s like bringing reddit to your classroom! But that’s not even the cool feature I want to mention here. Instead: I can post responses right there in Moderator. Students can revisit for answers, links, hints, or whatever I choose to leave for them. 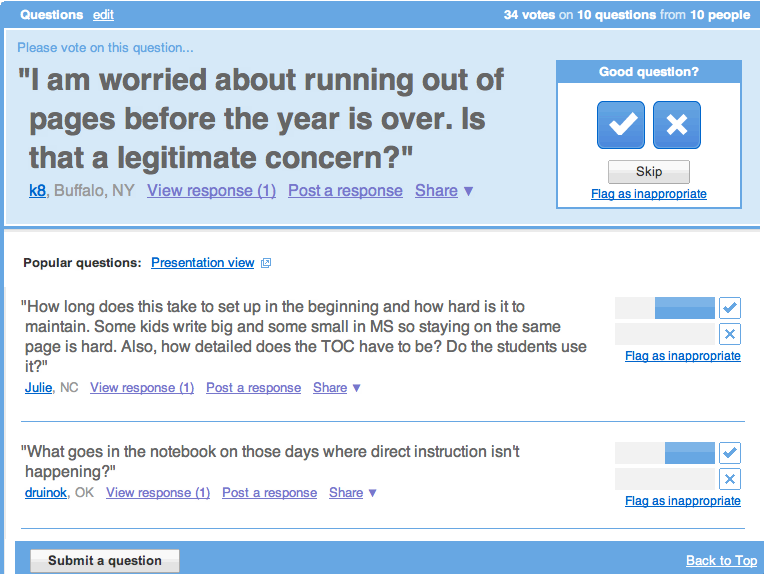 At #TMC12 last week, I learned about Socrative from @colinmac10 and @ehelfant. How’s it work? Direct students to m.socrative.com and give them your room number. Cool feature: E-mailed, color-coded reports are very nice. I’ve known about this one forever, so I can’t remember who first told me about it. Probably someone on Twitter. What is it? Like Socrative, a student response system. But this one uses SMS text messaging, so there’s a lower barrier of entry. I’ll bet my mom is the only one in the country who can’t text. How’s it work? You ask a question and give a SMS short code (5 digit number). Students send a text message with their response. It’s all anonymous. You *must* check out their How it Works page. There’s a reason these guys dominate the industry. Downside? Poll Everywhere is gonna be best when you have multiple choice questions or feedback opportunities. I haven’t seen a way to view other students’ questions and upvote them. A more lo-fi way to do this is the awesome<a href="http://jplgough.wordpress.com/2011/01/07/social-media-experimentbrain-amp-learning-formative-assessment/&quot; #20minwms experiment that a former WMS teacher started at W two years ago where students paused after 20 minutes of class and then too a moment to respond to the prompt “I am learning…” or “One question I still have is…”, and then questions were randomly distributed and read. From there, students could create a summary tweet with the hashtag #20minwms to share their learning with the wider community. This is really one of the best uses of twitter I’ve seen in the classroom. I wish we had kept it up.